Scientists have replicated a crucial photosynthetic reaction for the first time, taking them a step closer to creating sustainable, cheap fuel from water and sunlight - just like plants do. Plants use photosynthesis to turn water, carbon dioxide and sunlight into oxygen and the energy they need to power their systems. And for decades scientists have been trying to replicate this reaction in order to create biological systems that can produce cheap, clean hydrogen fuel. Now, for the first time ever, scientists from the Australian National University in Canberra, Australia, have managed to modify a naturally occurring protein, and use it to capture energy from sunlight, a key step in photosynthesis. Their results have been published in BBA Bioenergetics. “Water is abundant and so is sunlight. 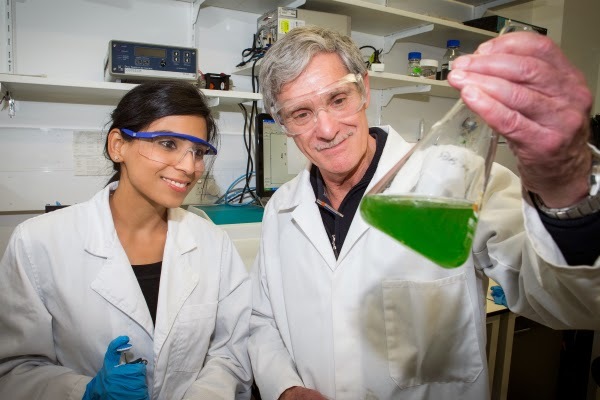 It is an exciting prospect to use them to create hydrogen, and do it cheaply and safely,” Kastoori Hingorani, the lead research from the ARC Centre of Excellence for Translational Photosynthesis, said in a press release. Hydrogen has the potential to be a zero-carbon replacement for the petroleum products that we currently rely on. But up until now, we haven’t been able to find a way to create it as safely and efficiently as plants do. To replicate this step in the reaction in plants, the research team took a naturally occurring protein called ferritin, and modified it slightly. Ferritin is found in almost all living organisms, and it usually stores iron. But the team replaced iron with the common metal manganese, so that it closely resembled the water splitting site in photosynthesis. They also replaced another binding site with a light-sensitive pigment, Zinc Chlorin. Once these changes had been made, the researchers shone light onto the modified ferritin and saw a clear indication of electrical charge transfer, just like the one that occurs in plants. The researchers describe this as the “electrical heartbeat” that’s the key to photosynthesis. The researchers now need to work on using this protein to create biological, water-splitting systems. But this is an important first step. One of the most exciting things about this research is that, because this protein is powered by the Sun and does not require batteries or expensive metals, the entire process could be affordable for developing countries. “That carbon-free cycle is essentially indefinitely sustainable. Sunlight is extraordinarily abundant, water is everywhere – the raw materials we need to make the fuel. And at the end of the usage cycle it goes back to water,” said Pace. Such a wonderful information for chemical research in the scientist.It's very very used for knowledgeable post. Thanks for sharing..It is very useful to me, keep updating.. I feel really happy to have seen your webpage and look forward to so many more entertaining timBest CCNA Training Institute in Guindy | No.1 CCNA Training Institute in Guindyes reading here. Thanks once more for all the details. This was an awesome post. Would definitely appreciate the efforts of admin to share with content with us.